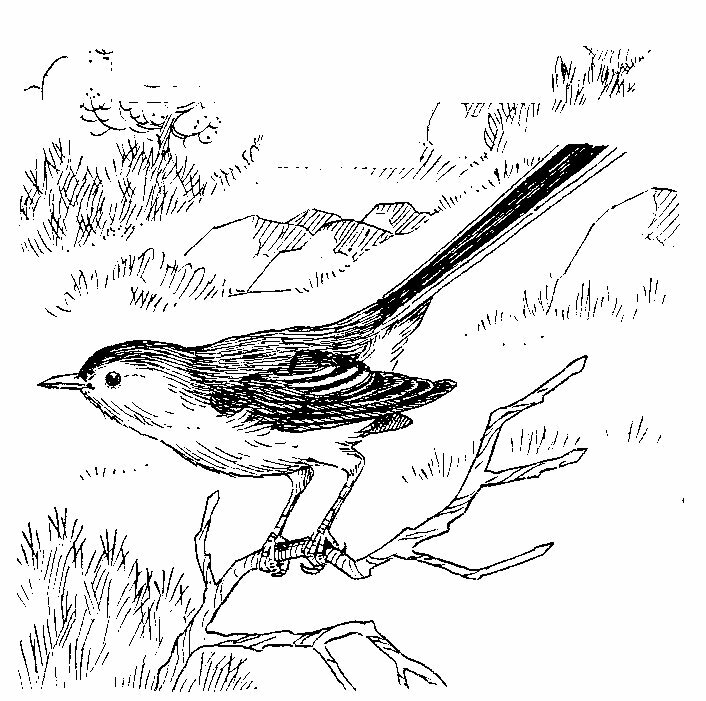 BLUE-GRAY GNATCATCHER (Polioptila caerulea): 4 1/2-5 in. Upper parts bluish-gray; indistinct white eye-ring; blackish forehead, wanting in winter and in female; long blackish tail; outer tail feathers white for most of their length; bill slender. Call often a single, wheezy c-h-e-e, like escaping steam. Active, nervous movements. Frequents brush and oak-covered slopes. Common S. V. in the Lower and Upper Sonoran life zones. Breeds in the foothills of the Sierra. Winters in the lowlands. In the Yosemite region in the Upper Sonoran zone and after the nesting season at higher elevations, including Yosemite Valley and Glacier Point. GOLDEN-CROWNED KINGLET (Regulus satrapa): 3 1/2 - 4 in. Upper parts olive-gray to olive-green; conspicuous orange crown bordered by yellow and black, wholly yellow in female; under parts whitish, tinged with brown especially on sides; white line over eye. Forages out on small branches and among needles chiefly in coniferous trees. Often travels in small groups. S. V. largely in the Canadian and Transition life zones. W. V. to lowlands west of the Sierra. In the Yosemite region present in summer chiefly in the Canadian zone. Recorded to 8,700 feet elevation on the slopes of Mount Hoffmann. Usually in Yosemite Valley throughout the year. RUBY-CROWNED KINGLET (Regulus calendula): 3 3/4-4 1/2 in. 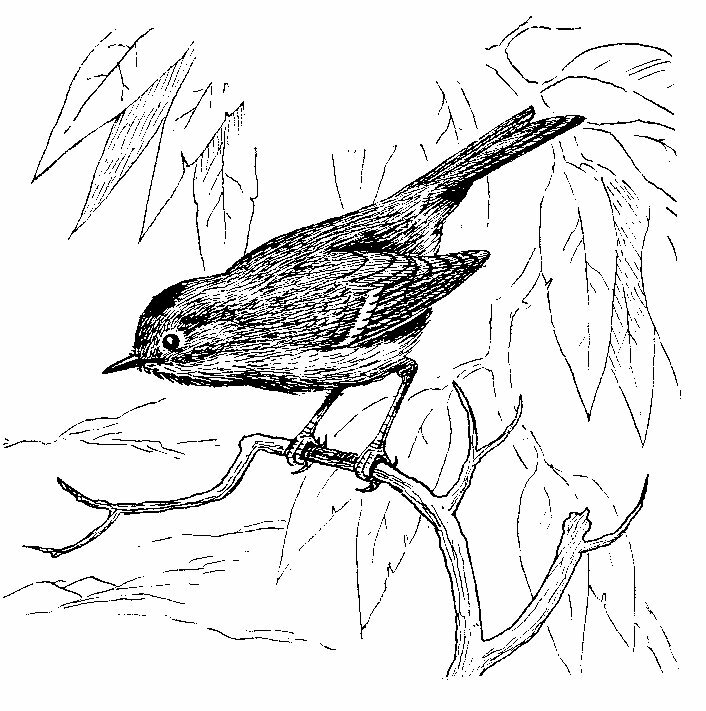 Upper parts grayish-olive; red crown-patch (often concealed); white ring around dark eye; under parts gray; tinged with yellow; two whitish bars on wing. Jerks wings nervously as it flits about among the branches. Commonly solitary. In summer frequents continuous or broken stands of coniferous forest chiefly in the Canadian life zone; less restricted in winter. Disperses widely to the lowlands in winter. In the Yosemite region during the breeding season, altitudes of occurrence are chiefly between 5,500 and 9,000 feet. Passes through Yosemite Valley, occasionally nesting there.